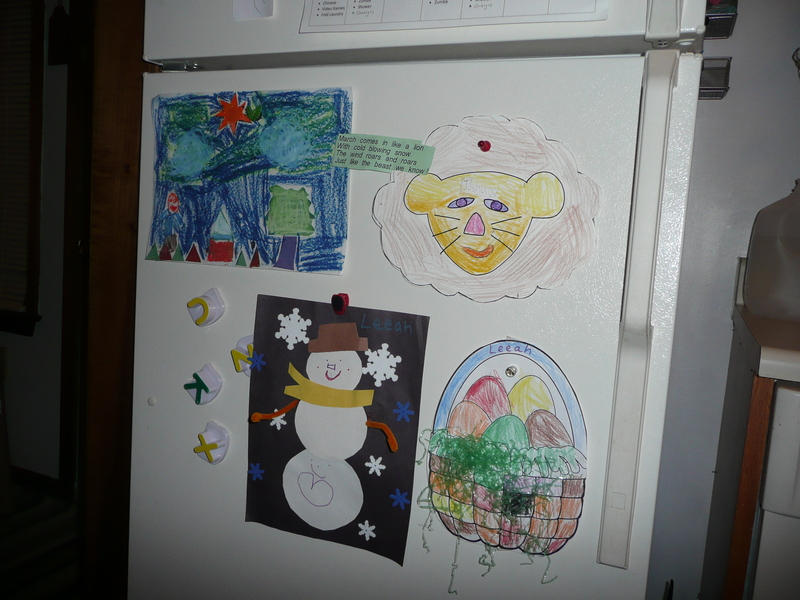 A very popular place in our home for the kid’s artwork is the fridge. But after a while it became very overcrowded and there was just not enough space. I came up with the idea of purchasing a large cork board which is now on the wall in our kitchen and I can put anything and everything up there, including the school lunch calendar, special notices or invitations as well as additional artwork that doesn’t fit on the fridge. Now-a-days we are keeping most of the kid’s artwork on the corkboard because our 2 younger children have been able to reach anything on the lower portion of the fridge and after watching a crazy show about a kid swallowing a magnet, I am now deathly afraid of that happening. So, we are only able to use the top part of the fridgerator for one or 2 really special things and the rest goes on the cork board. Yes this is a picture of our fridge, but I staged it. LOL I really do miss being able to showcase artwork on that bottom portion. But safety comes first. 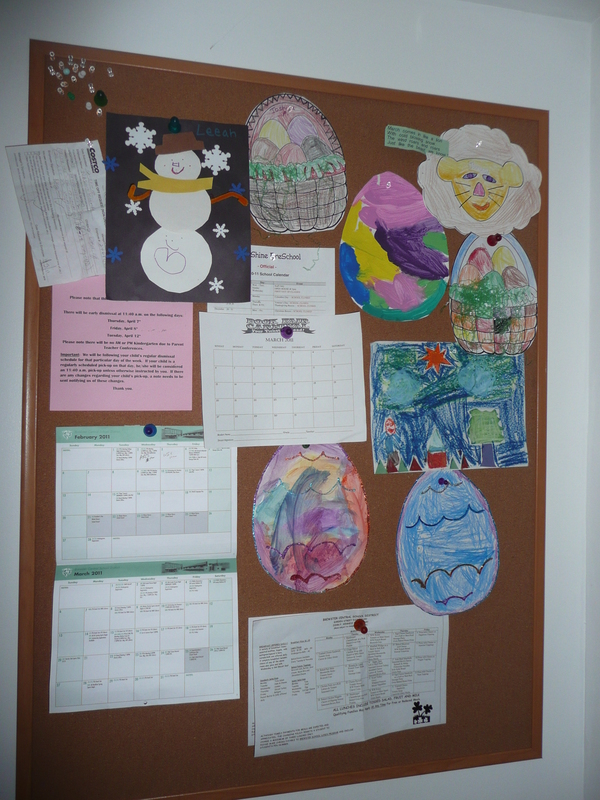 So, now, we use the cork board, and yes, you do see the same artwork because I put everything back where it belongs. LOL And the board is high enough that the younger ones cannot reach the papers and push pins. 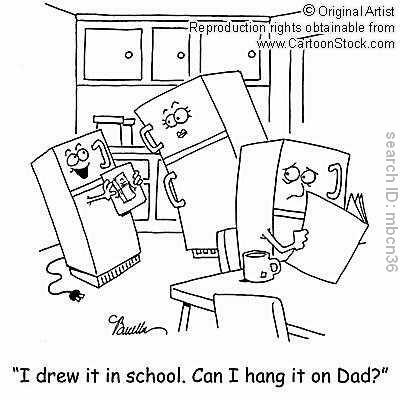 Being an artist myself, I am a huge fan of my children’s artwork. I keep the special ones filed away and pull the seasonal ones out to display. You can read more about my Kid’s Artwork DIY Organizational System Here. There is nothing like seeing the proud look of a child who brings home something that they have made. 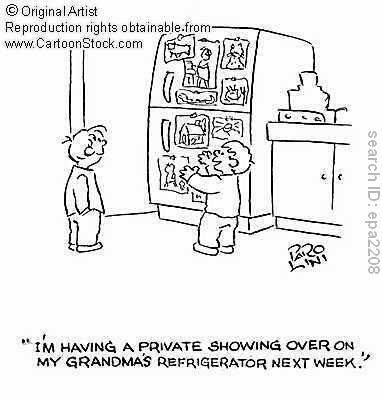 They LOVE to display it and what better place to do that than the fridge or a special board dedicated just for that. I make a big deal about what my children make, even if it is a bunch of scribble scrabble. I think it is important and helps a child with their confidence. How about you? 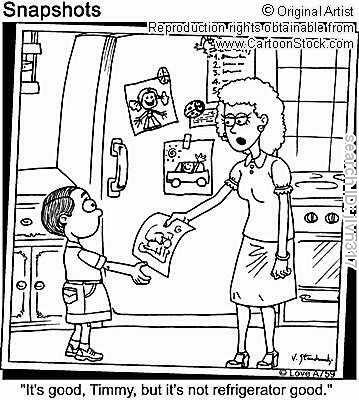 Do you have a fun place to display your children’s artwork? And do you keep certain things that are really special? Please comment! 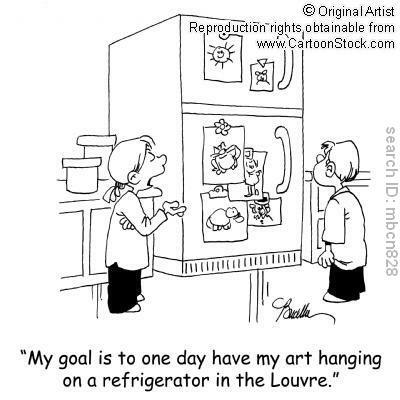 And of course I could not resist finding a few funny cartoons to go with the subject of refrigerator art. These are great!